In a paper that is bound to generate controversy, three University of Pennsylvania bioethicists argue in a medical journal this week for the return of the mental asylum. 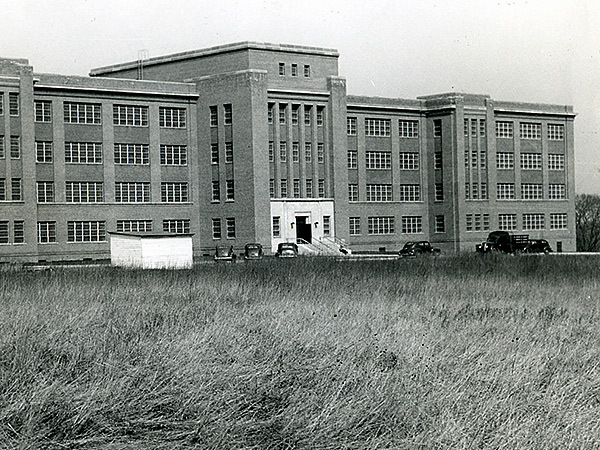 March 1945 photo showing Philadelphia State Hospital at Byberry. Ethicists at Penn are calling for a return to asylums but those that are better than the old ones, meet the latest standards and do a better job than prisons. The nation, they say, has too few inpatient beds for people with serious mental illnesses. As a result, very sick people are winding up homeless or in prison, nursing homes, and hospital emergency departments. Dominic Sisti, director of Penn's Scattergood Program for the Applied Ethics of Behavioral Healthcare and lead author of the new paper, used words like appalling and shocking to describe the current state of affairs, which he sees as both morally wrong and financially shortsighted. His article, titled "Improving Long-term Psychiatric Care, Bring Back the Asylum," appeared in Tuesday's Journal of the American Medical Association. It was coauthored by Andrea Segal and bioethics department chair Ezekiel Emanuel, who recently explored the downside of old age in another attention-grabbing essay, "Why I Hope to Die at 75." Sisti said their use of the word asylum wasn't meant to be "intentionally provocative." "We're hoping to reappropriate the term to get back to its original meaning, which is a place of safety, sanctuary, and healing, or at least dignified healing for people who are very sick." He said he anticipates some "pushback." Michael Brody provides it. He is president and CEO of the Mental Health Association of Southeastern Pennsylvania, which has long advocated for community care for people with mental illnesses. To him, the word asylum is "code for reinstitutionalization of people and segregating them," he said. "Ultimately what happens when these asylums are re-created is, people get lost, ignored, segregated, and forgotten. . . . They have no ticket back into the community." He thinks government dollars would be better spent on alternatives like Pennsylvania's long-term structured residences (LTSRs). These smaller facilities provide structure and support, but allow closer ties to neighborhoods. Even the most seriously mentally ill usually do not need the level of care provided in hospitals all the time, Brody said. He would also spend more on early identification and treatment of mental illness to prevent more serious problems. In the essay, the Penn team said the number of patients in the country's state psychiatric facilities fell from 560,000 in 1955 to 45,000 as a result of the deinstitutionalization movement. The United States now has 14 public psychiatric beds per 100,000 people, the same as in 1850. On average, Sisti said, countries in the European Union have 50 beds per 100,000. Pennsylvania has about 1,390 patients in its state psychiatric hospitals, with room for 1,450. The highest number on record was 35,000 inpatients in 1966. The New Jersey Department of Human Services did not respond to a request for information. The bioethicists, who do not shrink from multi-syllable words, argue that what really happened was not deinstitutionalization but transinstitutionalization. That means that at least some residents of mental hospitals did not thrive in their communities, as hoped, but shifted to inappropriate institutions, most notably prisons. "Prisons have become our largest mental health facility," Sisti said. An estimated 10 million U.S. residents have serious mental illnesses, according to the article. And many of them - especially those with severe schizophrenia and bipolar disorder - cycle among the street, hospitals, and jails. While it is clear that the country did not create enough community services, the ethicists argue that some seriously mentally ill people need inpatient care because they "cannot live alone, cannot care for themselves, or are a danger to themselves and others." Sisti said it is very hard to calculate how much inappropriate care is costing or how many people should be in asylums. He thinks about one-third of people with schizophrenia need supervised long-term care. He defined that as at least 60 days. He envisions asylums built in a campuslike environment with varying degrees of security. They would be "patient-centered and collaborative," and "modeled on the principles of the recovery movement, which emphasizes patient autonomy to the extent that that's possible." He said long-term placement might require changes to policies governing when patients can be treated against their will. As for the cost, the Penn team said a new state hospital in Worcester, Mass., has 320 private rooms and an annual budget of $60 million. That works out to $187,500 per patient. A state hospital in Michigan costs $260,000 per patient. While he thinks the best argument for long-term treatment is a moral one, Sisti thinks it would also be more cost-effective in the long run, "even at a quarter-million a year."